By connecting to our websites or logging into any of our multiplayer servers. You agree to abide by all Rules and follow directions from Staff members, in addition to the terms presented below. "Staff" are defined as users ranked as Staff Manager, Community Manager, Moderator (and its affixes: Junior, Senior, Trial, Chat), that preside over AspiriaMc related management or websites directly associated with The AspiriaMc servers. •	Any other AspiriaMc affiliated online or offline asset or contact medium. Donations are completely optional. Donations will not necessarily confer any special privileges, ranks, or status to those donating to the community. By donating to The AspiriaMc Community, you agree to the Terms of Service and this action does not give you authority or power above the Terms of Service. A repayment of your donation will not be made under any circumstances. By donating to the terms presented on AspiriaMc.com you agree that your donation is 100% optional, all presumed perks relating to donation to AspiriaMc are completely arbitrary, the perks and benefits outlined on AspiriaMc.com can be altered at any time and without warning. Service downtime, suspension from the server, changing your mind, or disagreeing with a decision made by AspiriaMc Staff members are not grounds for a refund. When using our AspiriaMc.com service you will be prompted to opt in to receive emails relating to AspiriaMc, relating to community updates, page changes, or notices. You may unsubscribe at anytime by clicking on the "Account Settings" tab and by doing so accessing your personal user settings and disable any unwanted email options associated with your account. 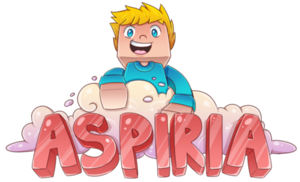 AspiriaMc website, server, and any other services or content provided is made available and provided to you at your own risk. It is provided to you as-is and we expressly disclaim all warranties of any kind, expressed or implied, including but not limited to the warranties of merchantability and non-infringement. You understand and agree that neither AspiriaMc nor any participant in the service provides professional advice of any kind and thus use of such advice or any other information is solely at your own risk and without our liability of any kind. AspiriaMc and its members shall not be liable for any special or consequential damages, even if we have been advised of the possibility of such damages, resulting from or arising out of the use of or the inability to use the service, the cost to obtain substitute goods and/or services resulting from any transaction entered into on trough the service, unauthorized access to or alternation of your data transmissions, statements or conduct of any third party on the service, or any other matter relating to the service. Note that by accepting the terms in the document, you are also waiving your right, to take any action, legal or otherwise, against anyone or anything related to the staff, management, administrators, members, owners or any hosts of this server. You furthermore acknowledge that if any part of this document is found to be invalid or unenforceable in any way, any parts not found to be invalid or unenforceable will be considered fully valid and binding. As a registered user of any AspiriaMc service, you may establish an account ("Account"). Do not reveal your Account information to anyone else. You are solely responsible for maintaining the confidentiality and security of your Account and for all activities that occur on or through your Account, and you agree to immediately notify The AspiriaMc Staff of any security breach of your Account. AspiriaMc and its Staff shall not be responsible for any losses arising out of the unauthorized use of your Account. •	You must be a human. Accounts registered by "bots" or other automated methods are not permitted. •	You must provide your a valid email address and any other information requested in order to complete the signup process. •	Your login may only be used by one person. •	You are responsible for maintaining the security of your account and password. AspiriaMc cannot and will not be liable for any loss or damage from your failure to comply with this security obligation. •	You are responsible for all Content posted and activity that occurs under your account (even when Content is posted by others who have access under your account). Do not misuse our Services. For example, do not interfere with our Services or try to access them using a method other than the interface and the instructions that we provide. We may suspend or stop providing our Services to you if you do not comply with our terms or policies or if we are investigating suspected misconduct. Using our Services does not give you ownership of any intellectual property rights in our Services or the content you access. You may not use content from our Services unless you obtain permission from its owner. These terms do not grant you the right to use any branding or logos used in our Services. Do not remove, obscure, or alter any legal notices displayed in or along with our Services. Harassment in any manner or form on the site, including via e-mail, chat, or by use of obscene or abusive language, is strictly forbidden. Impersonation of others, including an AspiriaMc or other licensed administrator, host, or representative, as well as other members or visitors on the site and its services is prohibited. You may not upload to, distribute, or otherwise publish through the site any content which is libelous, defamatory, obscene, threatening, invasive of privacy or publicity rights, abusive, illegal, or otherwise objectionable which may constitute or encourage a criminal offense, violate the rights of any party or which may otherwise give rise to liability or violate any law. You may not upload commercial content on the site or use the site to solicit others to join or become members of any other commercial online service or other organization. •	release or distribute server access information without Staff consent. •	save (in any form other than temporary Minecraft or browser server packets required for viewing and intended interaction), reproduce, mimic, or otherwise copy any content on the AspiriaMc server or associated websites or services, for either personal use or public distribution, unless you you hold the sole, original copyright on that content. Players found violating the Terms of Service may find their accounts or IP addresses restricted or eliminated from our Services. This includes, but is not limited to, AspiriaMc.com and The AspiriaMc Wiki. In addition, staff retain the right to kick you, ban you, or block your access to the the server or any other affiliated websites or services for any other reason, without explanation or warning. While some players may appeal their bans as a courtesy, server staff retain the right to revoke any request for a ban appeal. AspiriaMc.com may deliver notice to you by means of e-mail, a general notice on the site, or by other reliable method to the address you have provided to AspiriaMc.com. The Services that AspiriaMc provides are always evolving and the form and nature of the Services that AspiriaMc provides may change from time to time without prior notice to you. In addition, AspiriaMc may stop (permanently or temporarily) providing the Services (or any features within the Services) to you or to users generally and may not be able to provide you with prior notice. We also retain the right to create limits on use and storage at our sole discretion at any time without prior notice to you. The Services may include advertisements, which may be targeted to the Content or information on the Services, queries made through the Services, or other information. The types and extent of advertising by AspiriaMc on the Services are subject to change. In consideration for AspiriaMc granting you access to and use of the Services, you agree that AspiriaMc and its third party providers and partners may place such advertising on the Services or in connection with the display of Content or information from the Services whether submitted by you or others. All trademarks, service marks and trade names of AspiriaMc.com, associated websites and services used or mentioned on this site are trademarks or registered trademarks of AspiriaMc.